February 10, 2014 — report by Jacob Seelman for Race Chaser Online — Chris Seelman photo — OCALA, Fla. — Dave Blaney can still put on a sprint car clinic with the best of them. Blaney started on the pole and proceeded to blister the field, scoring the win in Sunday night’s UNOH All Star Circuit of Champions season-opening sprint car feature at Bubba Raceway Park. Wheeling the No. 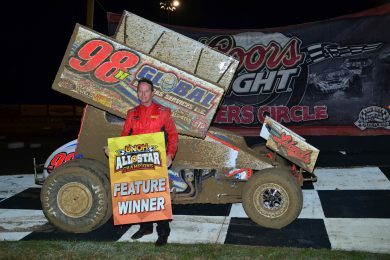 98 machine, Blaney held off four-time All Star champion Tim Shaffer for the victory. The triumph was Blaney’s 46th career win in All-Star competition. Steve Buckwalter finished third, ahead of Kerry Madsen and four-time and defending All-Stars champion Dale Blaney.